Summer and flip flops go together like PB and J, coffee and donuts...a diy-er and a never-ending mind full of ideas! I love when Old Navy has their super sale on flips and you can get several pairs for just a few bucks. Last summer I bought two pairs of their wedge flips, but when I got home I decided they were too plain and I would jazz them up a bit! I cut two old t-shirts down into strips and pulled the strips to create 't-shirt yarn'. Here's a great tutorial that shows you how to cut your tee into ropes. Starting at the end of the strap, I tied off two t-shirt ropes and then criss-crossed them all the way down to the toe area, tying them off again. I then repeated this for the other side. The great thing about t-shirt yarn is that it is stretchy, so you can pull it tight and make your knots almost invisible! I made bow and flower embellishments and added them to the toe area for a dash of extra cuteness! 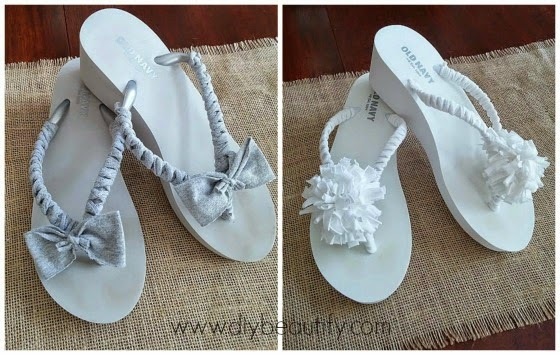 A thrifty hack and original flip-flops! If I get enough interest, I'll add a tutorial for the flowers. Let me know if you'd like to see a tutorial in the comments section below. Hi Cindy! Thanks so much for coming by and taking the time to leave a comment. I appreciate every one of them! I'm off to look around a bit! You are so sweet Suzanne ;) Thanks so very much for your comments, I really needed a nice one today! I hope you enjoy your browse at DIY beautify...you are welcome ANY time! I love the flip flops with the flowers. Love that I could modify them to look like pom poms. We are always looking for new gift ideas for our cheerleaders. Have you made a tutorial for the flowers? Cora, thanks so much! I'm in the process of putting together a tutorial and will update this page once I've posted it.